We decided to drive out to the middle of the course to get some photos from the Sprint and KOM points and were immediately struck by the beauty of the route, winding it’s way along the Gorge Road through the Adelaide Hills region. This area has recently been affected by bush fires and fire damage was very evident in places, especially at the top of the KOM climb. Not that the riders had time to enjoy the scenery, once again the pace was fast with the leading group completing the stage in 1h47 at an average of 40 kmph. Our plans for photography were derailed by the pace of the race. We never got to the KOM climb after seeing the sprint and got stuck behind the race after that so missed the finish as well. Poor planning on our part redeemed slightly by getting a few interviews at the end. 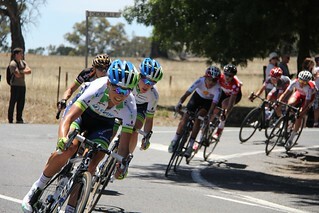 Stage 4 tomorrow should prove to be very interesting with all three jerseys still up for grabs. In the GC, Scandolara leads by 6 seconds from 7 other riders, 5 of which are from other teams. 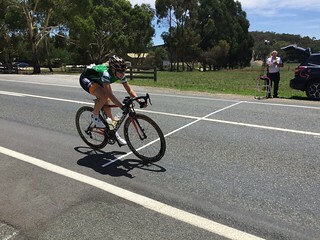 Annette Edmondson of Wiggle leads the Sprint competition with a 5 point lead over Roxsolt’s Lauren Kitchen and 7 over Melissa Hoskins of Orica AIS. The Mountains jersey is still held by Loren Rowney (Roxsolt) who has 4 points over Scandolara and 5 over Hoskins. All this means that if the fast aggressive racing continues tomorrow, especially if Roxsolt decide to try for the Sprint and Mountain jerseys, anything could happen. It’s sure to be an excellent evening of racing.